Your stop number for King County Metro stops can potentially be in a couple of different places. It can be included directly on the stop sign at newer stops. If your stop has a bus shelter, it is painted in the upper left corner. Finally, it is also included in a tricky to find spot on the printed schedule for each stop. If all these fail, the phone interface includes an option for looking up your stop number based on your route. 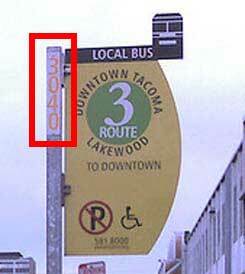 Pierce Transit stop signs often include the stop number. Since Sound Transit service extends over multiple counties, use the rules for each county above when attempting to find your stop number.